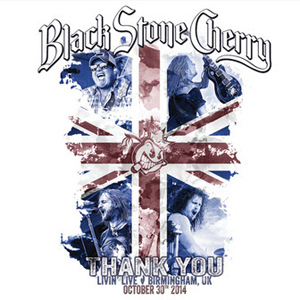 BLACK STONE CHERRY are set to release Thank You: Livin’ Live, the band's debut live album, on October 30th via Eagle Vision. The release will be available as a DVD+CD, Blu-Ray+CD, Digital Video, and Digital Audio option. The performance was shot on BLACK STONE CHERRY’s Magic Mountain tour, exactly one year prior to the disc’s scheduled release date, at the band’s sold-out Birmingham LG Arena show on October 30th, 2014. In just seven years, BLACK STONE CHERRY progressed from playing 200-capacity club gigs in the UK to headlining their first arena tour. This DVD documents one of those triumphant shows, filmed at Birmingham’s LG Arena and showcases the band’s long-standing love affair with their British audience. Filmed in high definition and available on DVD, Blu-ray and twin DVD+CD pack, the incendiary live set features crowd favourites from all four of the band’s studio albums, plus bonus interview material and additional live tracks shot at this year’s Download Festival. The band is thrilled to bring this release to their fanbase, as guitarist Ben Wells attests: “We are beyond excited to bring you all this live DVD. Growing up watching my Elvis and AEROSMITH DVDs and VHS tapes, I never thought I would be in a band that would one day be releasing one - and in an arena at that! We are so honored, humbled, and thankful to have the fans and friends we have in this business and we couldn't do it without the grace of God and all of your support! Sit back and enjoy this live BSC experience. We had a blast filming it!" A video from the show for the song “White Trash Millionaire” has also been released and you can watch it on KNAC.COM right HERE.